Film adaptation of multiple Batman comic book storylines follows the caped crusader as he squares off against a mysterious vigilante. 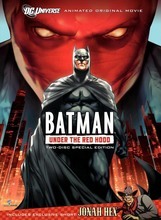 Gotham City finds itself gripped by the mysterious presence of the Red Hood, a Batman-esque vigilante/criminal hybrid committed to cleaning up the metropolis without an adherence to any discernible sort of moral code. When the Joker inevitably jumps into the equation, Batman must struggle with old wounds and personal problems as he works to defuse a potentially-dangerous challenge to his supremacy.